An organic, high lignan, pure and unfiltered cold pressed flax oil. 1-2 Tbsp. daily. Can be taken straight or mixed into salad dressing, yogurt, oatmeal, cottage cheese or blended beverages. Stirring suggested to full disperse flax particulate. Once opened, use within 6 weeks and keep refrigerated between uses. Due to the fresh nature of this product, we cannot guarantee long expiry dates. 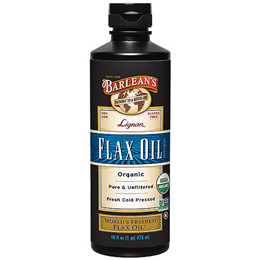 Below are reviews of Barlean`s Lignan Organic Flax Oil - 473ml - Best before date is 4th June 2019 by bodykind customers. If you have tried this product we'd love to hear what you think so please leave a review. Established in 1989, the Pathway to a Better Life, Pure & Unfiltered, Fresh Cold Pressed, USDA Organic Flax oil is America`s bestselling Omega-3. Certified Organic by QAI.